The Warframe dev team have put together a new dev blog Arbitrations, which provide players with a unique challenge when taking on missions. Get a full rundown on Arbitrations via the post below. When these changes go live next week on PC (and consoles in the near future), the rules of Arbitration death will be a little different: players are still killed with no bleedout timer, but a revive tower will be placed at the player’s spot of death. If any squadmate is awaiting revive, the Arbitration drones will begin dropping unique﻿ pickups known as a “Resurgence Burden”. These pickups function similar to Index points (otherwise known as “Financial Stress”), debuffing the players who carry them. Canadian developer and publisher Digital Extremes is thrilled to bring the renewed open-world Warframe® Landscape, Plains of Eidolon Remaster, to the PlayStation®4, Xbox One, and Nintendo Switch™ today. 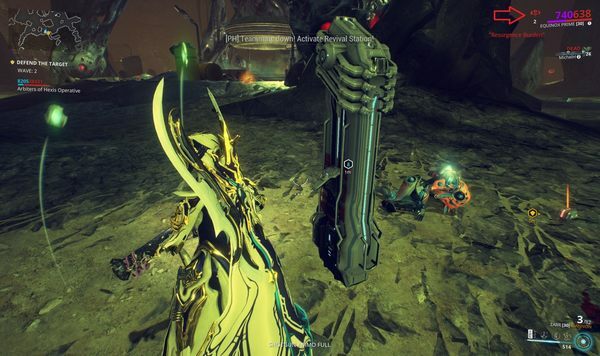 With a full graphical overhaul using the graphics technology created for last fall's Fortuna, Plains of Eidolon Remaster delivers dynamic lighting, textures and atmosphere, resurfaced terrain for better K-Drive Hoverboard action, and introduces conservation and a new Grineer menace, the wily Tusk Thumpers. Plains of Eidolon Remaster is free to download on consoles today. The graphical overhaul will enhance all visual aspects of Plains of Eidolon Remaster. Warframe's open world will see advanced lightning techniques that bring brilliant lighting and shadow changes to the day-night cycle, sending god rays through more detailed trees, bush and fog, and will add crisp new texture details to the foliage and earthen landscape. For the K-Drive, players will experience new terrain to jump off and grind on, and should be wary of the new Tusk Thumper enemies, three different pneumatic ground-pounders that smash anything in their way. Tenno can now earn a new badge for hunting and conserving three new animals on the Plains -- previously only available on Fortuna -- and special Floofs with which to decorate their Orbiters. Canadian developer and publisher Digital Extremes has renewed its commitment to Warframe's breakthrough open-world Landscape, Plains of Eidolon, with a full graphical overhaul available today on Steam PC. Retrofit with the graphics technology created for last fall's Landscape Fortuna, Plains of Eidolon Remaster delivers dynamic lighting, textures and atmosphere, resurfaced terrain for better K-Drive Hoverboard action, and introduces conservation and a new Grineer menace, the wily Tusk Thumpers. Plains of Eidolon Remaster is free on PC today. The graphical overhaul will enhance every visual aspect of Plains of Eidolon Remaster. Warframe's open world will see advanced lightning techniques that bring brilliant lighting and shadow changes to the day-night cycle, sending god rays through more detailed trees, bush and fog, and will add crisp new texture details to the foliage and earthen landscape. 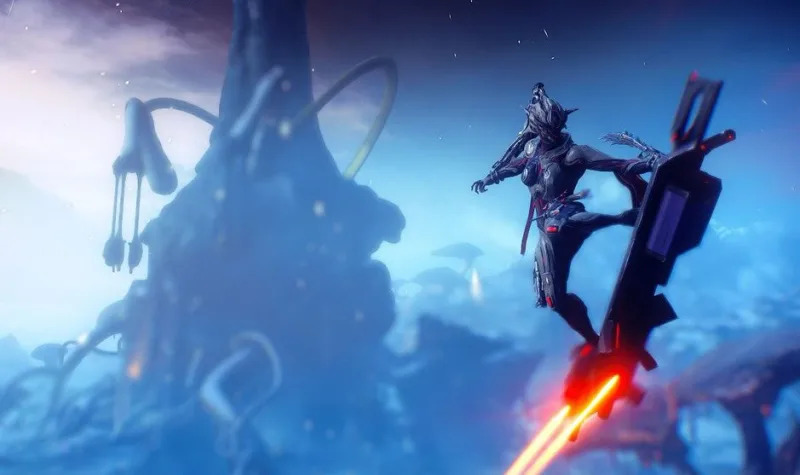 Warframe hit the Switch in late 2018, but the game has been around a lot longer than that. Believe it or not, Tennos have been causing all sorts of space hi-jinx for 6 years now! The best part of it all is that the game just keeps growing. In a recent interview, Digital Extremes revealed that Warframe is nearing 50 million registered users. No doubt the Switch has added quite a few players into the mix, as Digital Extremes labeled it as a 'growing platform' for the game's player expansion. We also learn that after TennoCon, Warframe had a streak of roughly four weeks where they had over 1 million people playing concurrently. I know I was in there mixing it up, and I'm sure quite a few of you were as well! LONDON, ON – March 20, 2019 – Coming today to PlayStation®4, Xbox One, and Nintendo Switch™, Canadian developer and publisher Digital Extremes will unveil Warframe®'s newest update, Operation: Buried Debts -- coupled with an enigmatic challenge. Deep in the bitter heart of Fortuna's Orb Vallis lies a hidden mystery, one that Tenno must confront together to unlock. Paired with the Update is the immediately gratifying first phase of Warframe's melee system updates, and the arrival of the 39th Warframe, Hildryn, adding depth and power to a healthy stable of 38 playable Warframes. Operation: Buried Debts poses a disturbing new wrinkle to the evolving story of Fortuna's debt-internment colony. Following the original expansion and the subsequent update, The Profit-Taker, Tenno must work alongside the community and Solaris United to locate, uncover, and solve a multi-part Operation and the mystery lurking below the surface. Player will earn unique items throughout the Operation, but they'll need to take down a tremendous foe to unlock the final reward. Instantly noticeable to players new and old is the integration of Melee Changes: Phase 1. With this first update, players will experience more fluid combat and a smoother, faster, bolder system. Beyond instant weapon-melee switching, when interrupting a melee combo with gunfire, dodging, bullet jumping, or any parkour, players' next melee attack will resume the combo where it left off (within a window). Find more details in our Dev Workshop. Following last year's open-world debut with Plains of Eidolon, Fortuna is a sweeping open-world landscape on the visionary terraformed planet of Venus, giving both players a chance to quickly access entirely new gameplay content, all for free. Explore the huge new terrain on foot, hop on the radical Bondi K-Drive Hoverboard, soar through the air via Archwing, or lose yourself exploring, hunting, mining, fishing, and facing off against the nefarious Nef Anyo. Buried Debts is the second major update to Fortuna, following The Profit-Taker, currently available on PC, PlayStation®4, Xbox One, and Nintendo Switch™. Introducing the very first Esteem Pack, exclusively for Nintendo Switch! Give your Excalibur a pearlescent new look with the Excalibur Opal Skin, or equip the Guandao Opal Skin to make your polearm shimmer with every slash. Similar to the PS4 Renown Pack or the Xbox One Prestige Pack, the Esteem Pack includes a suite of items meant to show off your allegiance to Nintendo Switch. This pack can only be purchased once per account and is available for a limited time. Get your Esteem Pack and Nintendo Switch-exclusive items today! LONDON, ON – March 7, 2019 – Deep in the coldest regions of Fortuna's Orb Vallis lies a frigid, foreboding story waiting to be uncovered. In Warframe®'s newest update, Operation: Buried Debts, available today for free on PC, Canadian developer and publisher Digital Extremes will challenge Tenno new and old to band together in its first, time-limited Community Event of 2019 to unlock hidden secrets and dark lore. To thwart the bitter cold and the dread it brings, the 39th Warframe Hildryn arrives in heavy armor and shield-based powers, adding depth and power to a healthy stable of 38 playable Warframes. Operation: Buried Debts poses a disturbing new wrinkle to the evolving story of Fortuna's debt-internment colony. Following the original expansion and the subsequent update, The Profit-Taker, Tenno are thrust into a new storyline that re-defines the cynical deal Nef Anyo holds over the Solaris United Faction. Teaming up with your fellow Tenno won't just be a good idea, it will be a must! Players hungry for a new warframe play-style and dynamic new visual aesthetic should enjoy Hildryn, the newest warframe. Unlike most Warframes, Hildryn draws from her Shields to fuel her Abilities, while Energy works to recharge them. Take her to the skies and rain down destruction with a powerful set of offensive and team-based tools! See more details below. Shield Pillage: Pillage a percentage of Shields and Armor of nearby enemies to replenish her own Shields and Overshields. Unlock Rewards: Earn unique items throughout the Operation such as an Emblem, Sigil, Amalgam Mods, and the Opticor Vandal, but you'll need to take down a tremendous foe to unlock your final reward. You'll find your first clue waiting for you in the Vallis. Enhance Yourself: Earn Hildryn's specialized new Surator Syandana and Asuron alt helmet, the Corpus Quaro Syandana, and wield her signature heavy weapon, the Larkspur, a unique and menacing Arch-gun with a wild initial attack that locks onto a target then chains other targets close to the first. Phase 1 of the much-anticipated Melee revamp is here! With these changes, players will experience more fluid combat and a smoother, faster, bolder system to harness as they slash through the Origin System. Beyond instant weapon-melee switching, when interrupting a melee combo with gunfire, dodging, bullet jumping, or any parkour, players' next melee attack will resume the combo where it left off (within a window). Find more details in our Dev Workshop. Following last year's open-world debut with Plains of Eidolon, Fortuna is a sweeping open-world landscape on the visionary terraformed planet of Venus, giving both new players and veterans a chance to quickly access entirely new gameplay content, all for free. Explore the huge new terrain on foot, hop on the radical Bondi K-Drive Hoverboard, or soar through the air via Archwing and lose yourself exploring, hunting, mining, fishing, and facing off against the nefarious Nef Anyo. Buried Debts is the second major update to Fortuna, following The Profit-Taker, currently available on PC, PlayStation®4, Xbox One, and Nintendo Switch™. This content is hitting PC today, but it won't be coming to Switch for quite some time. I figured we'd share an early look at what's to come, and we'll certainly keep you posted on release plans for Switch. LONDON, ON – February 27, 2019 – Canadian developer and publisher Digital Extremes signals today the beginning of Warframe®'s Nightwave, a new ongoing radio broadcast built on fresh, immediate story-infused gameplay, available today. With Nightwave, players tuning into their Orbiter Scanners can instantly embark on new challenges, collect exclusive rewards, gear, cosmetics and more. And, for the first time in Warframe history, this new content is simultaneously available across all systems -- Steam PC, PlayStation®4, Xbox One, and Nintendo Switch™ -- for free. Tenno listening to Nightwave will experience the rebellious, smoky smooth allure of host Nora Night, the mysterious character whose rogue radio transmissions kick off the first series today with episode one of The Wolf of Saturn Six. Players will discover new enemies and backstory and earn unique rewards to upgrade their Arsenal as they rise through the Reward Tiers. Nightwave rewards are both exclusive and time sensitive: Players can only get them during the duration of the Series. They range from Power items such as Orokin Catalysts, Wolf Cred (a new currency used to shop through Nightwave Cred Offerings containing former Alert System rewards), sought-after Weapon/Warframe slots and highly coveted Forma Bundles, while exclusive, time-sensitive Cosmetics include an Armor Set, Syandana, and Noggle, among other items. Once the first series The Wolf of Saturn Six reaches its conclusion, a new one will begin, with an all-new storyline, incentives and exclusive rewards specific to it. Check Warframe.com for more details on specific rewards. Get the Wolf of Saturn Six assets now! In a huge bonus specifically for Nintendo Switch™ players, The Wolf of Saturn Six update will contain even more content! Nintendo Switch players will get the intense boss battle and additional content of Fortuna: The Profit Taker, and we'll debut TennoGen, the Digital Extremes-approved, community created content players love to own. LONDON, ON – February 26, 2019 – Canadian game developer and publisher Digital Extremes is ecstatic to announce ticket tier details for TennoCon 2019, its fourth annual Warframe® convention, and its official partnership with the Canadian Mental Health Association, Middlesex Branch (CMHA Middlesex) of London, Ontario. To be held Saturday, July 6, in the London, Ontario Convention Center, TennoCon 2019 will be bigger and more exciting than ever, featuring fun activities, staff- and partner-led panels, an annual Cosplay Contest, playable game kiosks, and will finish with TennoLive, the bigger-than-life Devstream packed full of surprises. Last year's event revealed Railjack, Fortuna, The New War, and Warframe on Nintendo Switch™. What will this year's TennoLive offer? Come to TennoCon or watch it on www.twitch.tv/warframe to find out! Interested in seeing the world's largest gathering of Warframe players? TennoCon 2019 tickets are available from a handful of tiers starting at 11 am PST/2 pm EST, Thursday, February 28, at the official TennoCon website, warframe.com/tennocon. A portion of the event's proceeds will be donated to CMHA, Middlesex. Full Day Ticket – $30 CAD – includes full-day access to the conference and Swag Bag, TennoCon digital Glyph, Sigil, Exclusive Cosmetic (Armor Set), 475 Platinum, Digital Art Piece (Ship Deco), Emote, and exclusive access to Baro Ki'Teer in the TennoCon Relay with a new extended time: 8 am PST/11 am EST, Saturday, July 6, to 8 am PST/11 am EST, Saturday, July 13. Collector's Ticket – $75 CAD – includes full-day access to the conference, Swag Bag, TennoCon digital Glyph, Sigil, Exclusive Cosmetic (Armor Set), 1,000 Platinum, Digital Art Piece (Ship Deco), Emote, exclusive access to Baro Ki'Teer in the TennoCon Relay with a new extended time: 8 am PST/11 am EST, Saturday, July 6, to 8 am PST/11 am EST, Saturday, July 13; and 2019 TennoCon Collector's T-shirt. Limited VIP Ticket – $250 CAD – includes full-day access to the conference, Swag Bag, TennoCon digital Glyph, Sigil, Exclusive Cosmetic (Armor Set), 1,000 Platinum, Digital Art Piece (Ship Deco), Emote, exclusive access to Baro Ki'Teer in the TennoCon Relay, with a new extended time: 8 am PST/11 am EST, Saturday, July 6, to 8 am PST/11 am EST, Saturday, July 13; VIP Brunch @ Digital Extremes, Early Access to TennoCon, Collector's Statue: Choose your own (Valkyr/Nyx/Rhino/Mag), and 2019 TennoCon Collector's T-shirt. Limited Legendary Ticket – $1,000 CAD – includes full-day access to the conference, Swag Bag, TennoCon digital Glyph, Sigil, Exclusive Cosmetic (Armor Set), 1,000 Platinum, Digital Art Piece (Ship Deco), Emote, exclusive access to Baro Ki'Teer in the TennoCon Relay with a new extended time: 8 am PST/11 am EST, Saturday, July 6, to 8 am PST/11 am EST, Saturday, July 13; 2019 TennoCon Collector's T-shirt, VIP Brunch @ Digital Extremes, Collector's Statue: Choose your own (Valkyr/Nyx/Rhino/Mag), Early Access to TennoCon, 4x TennoCon T-shirt mega-pack, NPC Voice Recording Session: Voice a Relay NPC!, DevStream Team Session: Ask your own questions for a 15-minute personal Devstream Couch Session (not streamed)!, and Custom Personal Glyph (We'll design a Glyph with you that's yours and yours alone). Digital Pack (sales start Tuesday, March 19) – $24.99 USD – For players unable to attend TennoCon, this Digital Pack offers these exclusive goods, including TennoCon digital Glyph, Sigil, Cosmetic (Armor Set), 475 Platinum, Digital Art Piece, Emote, and exclusive access to Baro Ki'Teer in the TennoCon Relay. Digital Packs can be purchased at warframe.com/tennocon, and at the PlayStation Store, Xbox Games Store and Nintendo eShop. TennoCon is one of the most powerful ways for Digital Extremes to share, connect and celebrate Warframe with its community, who travel from as close as Toronto and as far away as Australia to attend. As a key pillar in its mission to embrace and support its community, Digital Extremes this year has partnered with Canadian Mental Health Association, Middlesex Branch (CMHA Middlesex) of London, Ontario. CMHA Middlesex will attend TennoCon with volunteer staff members and stage a booth with information of its vital services. Its team will participate alongside DE's in celebrating the strength of communicative, supportive, and inclusive communities. "CMHA Middlesex is excited to partner with Digital Extremes and bring a greater understanding of self-care and mental health to the digital and gaming industry," said Beth Mitchell, Chief Executive Officer, Canadian Mental Health Association, Middlesex. "Mental health and addictions are at the forefront of our society's conversations, and as more individuals come forward we are thankful for the partnerships with community-focused organizations that help us promote positive mental health and support those with mental health concerns. We look forward to partnering with Digital Extremes and continuing the conversation around mentally healthy lifestyles for the gaming community." Available now for free across four platforms and powered by more than 38 million registered users worldwide, Warframe has nurtured a devoted community by embracing it. Now in its fourth year, TennoCon is Digital Extremes' way of thanking its community and celebrating its diversity, support, and citizenship! This year, the Warframe Cosplay contest is rewarding more contestants than ever before. Digital Extremes is offering a grand prize total of $6,000 (CAD) to the best-of-show contestant, $3,000 (CAD) for second place, and $1,000 (CAD) for third place. Players unable to attend TennoCon can tune into TennoCon online at twitch.tv/warframe throughout the day for exciting reveals and rewards, highlighted by the ultimate Warframe stream, TennoLive! For more information about Warframe and to download it for free on PC, Xbox One, PS4, or Nintendo Switch™ visit the official website at warframe.com. Another big chunk of content is coming to Warframe on Switch soon. The second part of the Fortuna update has been submitted to Nintendo for approval. Check out the full details below. In the late hours of the night, our team has submitted Fortuna: The Profit Taker to Cert! This is Part II of our Fortuna Update, and now we wait for word on its approval & launch! Fixed an issue where players could not be selected from the Chat list. Fixed an issue where the Show Profile option in the Chat player dropdown menu would not function correctly. Fixed an issue where the Inspect Player functionally would not work correctly. Fixed an issue where clients would not see the laser doors during Orb Vallis rescue missions. Fixed Friends list not accurately showing all Switch friends. 3 Bundles of TennoGen have made their way to Nintendo Switch, with more to come very soon! With all that said, there is still ongoing work behind the scenes on performance gains that we are hoping to make. We have some promising leads, and will update you as the weeks go on! We will notify you as we learn more about the Cert status!